Once upon a time, there was a little star named Cheeseburger. He named himself that, because cheeseburgers were his favorite food, and he had no parents to name him something a little less silly. Cheeseburger was no ordinary star, even though he lived in the sky. He was different than the rest of the stars. He was made out of taco shell and had big, floppy bunny ears. 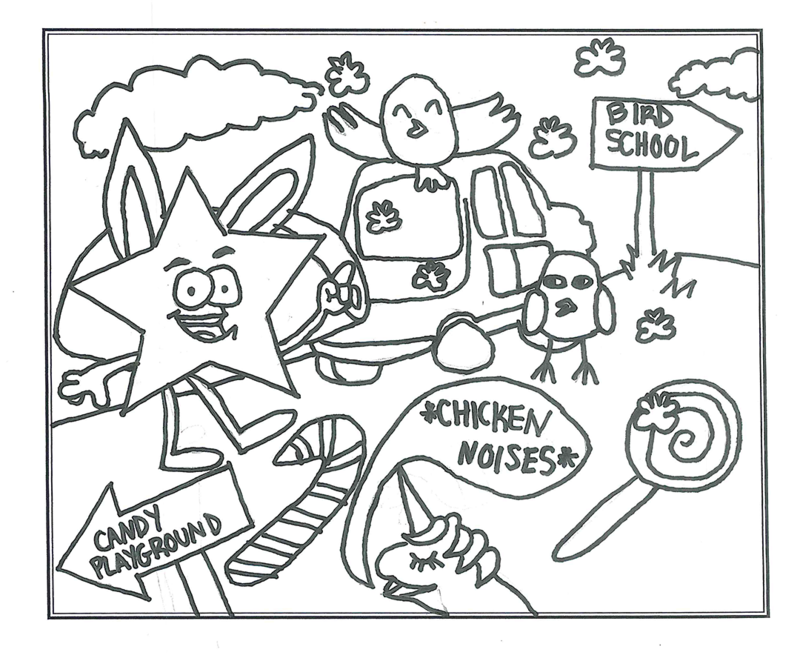 Every day, Cheeseburger would go play with his bird friends, because none of the other stars would play with him. They would race in their butterfly cars and eat candy all day. The unicorn pony responded, “Ca cawwwww!” Cheeseburger fell to the ground in laughter. “But seriously, why are you making chicken noises? You’re a unicorn,” Cheeseburger said. “Really? Can I come meet them? My name is Uni. Even though I’m a unicorn, I have always wanted to be a bird. Chickens are my favorite,” Uni said. Cheeseburger was so excited that he decided to bring Uni to the bird school so he could meet all of the bird friends and maybe learn how to be a better bird. They went through the forest and flew through the sky until they got to bird school. When they got to the bird school, Cheeseburger and Uni knocked on the door, and the mother hen answered. “Why are you here? You’re a unicorn and a star made out of a taco shell,” she asked. “We would like to learn how to be birds. We love birds and all of our friends are birds, and we would like to be birds with them,” they exclaimed. “That’s ridiculous!” the mother hen said. “You’re a unicorn and a star.” And with that she slammed the door right in their faces. Uni and Cheeseburger decided they weren’t going to take no for an answer. They were going to go to bird school whether the mother hen wanted them there or not. They flew over the bird school trying to find a way in. They looked down and saw a teeny, tiny chimney. “I think we can go in that way,” Cheeseburger said. So they flew over to it to see if they could fit.